Dentdale is a remote and very stunning valley situated at the far northwest corner of the Yorkshire Dales National Park and is also in one of the finest Cumbrian Dales. Nestling between the rugged Pennines to the east and the Howgill Fells to the west the valley gives in to charm, beauty and historical interest. Dentdale is a farming community with many scattered homesteads each sharing the fell and valley floor owing much to the settlement patterns of the Vikings who came here in the 10th century. The River Dee, formed from several smaller streams spilling out from Blea Moor Moss, rises at Dent Head Farm flows northwards past Stone House to Cowgill then turns left into Dentdale. As it flows through this steep sided valley with lush green meadows it picks up the waters of Deepdale Beck making its way north from Whernside before passing Dent and Gawthorp. The river then travels past Lenacre and Rash to meet the River Catholes near Sedbergh. The old water mill at Rash Bridge is thought to have been an inspiration for the folk song “The Jolly Miller of Dee”. Dentdale, criss-crossed with public rights of way and bridleways, provides great walking with the most wonderful views. Not only is there the Dales Way following the River Dee you have Whernside and the Howgill Fells which offer superb views of both the Yorkshire Dales and the Lake District. Wainwright described the Howgills as looking like ‘a herd of sleeping elephants’. There are also many outdoor pursuits such as cycling, mountain biking, fell running, horse riding, pony trekking, fishing and sailing. A black crinoidial limestone found in certain areas of Dentdale has long been sought after for its amazing quality of fossil remains. In the late 18th century the marble led to a boom in local quarrying and the main quarry was owned by Richard Alderson whose mill at nearby Stonehouse was famed for producing beautifully polished fireplaces featuring the white fossil patterns embedded in the background of dark natural rock, the material itself became known as ‘Dent Marble’. By the mid 19th century the Stonehouse products were being exported worldwide but as cheaper Italian marble became available in Britain the mill was forced to gradually close. Even though Dentdale is only 10 miles long the scenery and flora towards the eastern end of the dale differs from that to the west. The difference is determined by the ‘Dent Fault’ one of the many geological phenomena of the area which fascinated Adam Sedgwick and drew him towards establishing the new science of Geology. The Dent Fault is a major fracture in the earth’s crust and was formed about 290 million years ago during a period of mountain building known as the Variscan Orogeny. Adam Sedgwick was the first to discover this important fault. 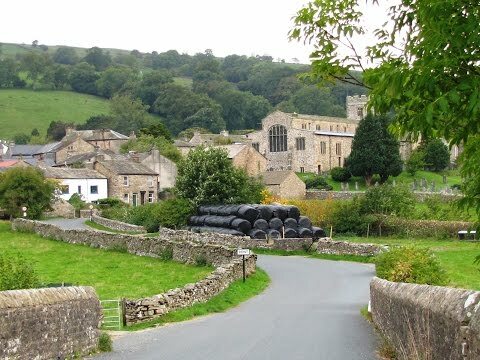 Dent, the only village in Dentdale, is small but very attractive with cobbled streets lined with white washed cottages. The village houses a church, a shop, two cafes, a blacksmith’s shop, an art gallery, a Heritage Centre and two pubs The Sun Inn and the George and Dragon. The 12th century Church of St. Andrew which stands prominently in the village has alter flags made from their most famous mining export black Dent marble and Norman features in the tower, the nave and the Norman arched doorway can still be seen. Where the three cobbled streets of Dent meet stands a fountain of pink granite commemorating Dent’s links with Adam Sedgwick a professor of geology at Cambridge University who was one of the greatest field geologists of this time. Sedgwick, the local parson’s son, was born in the village in 1785 and never forgot his native home until the day he died in 1873. He was first schooled by his father at the Old Grammar School, which can still be seen in Dent’s churchyard, before attending nearby Sedbergh School and finally completing his studies at Trinity College in Cambridge. In the 18th century Dent was famous for its hand knitters. Known as the “Terrible Knitters of Dent” men and women would knit even while they were working. By holding one needle or ‘prick’ in a wooden knitting stick protruding from a belt and the other in the right hand the left hand was free to do another job such as churning the butter or wrapping the cheeses. The farmers would knit with one hand whilst milking a cow with the other until visitors arrived to see them the men then became self conscious and left knitting to their women folk. Children also contributed. The knitting was an endless supply of warm clothing such as gloves, caps, socks, jumpers and pullovers and provided an essential addition to their meagre farming income until the early 19th century. The Heritage Centre, designed and built entirely of local labour, has been converted and extended on the site of the old filling station. The centre offers much information on the working lives and social customs of the Dalesfolk who lived in Dentdale in past times, including Dent Marble, Adam Sedgwick, a model railway and tales of the ‘Terrible Knitters’. There is so much more to see in the centre, therefore it is well worth a visit. Dent was the original site of the Dent Folk Festival and as from 2009 it is now the site of the Dent Music and Beer Festival held at the end of June. Dent Head’s very impressive viaduct carries the Settle to Carlisle Railway through Dentdale offering wonderful views from Ribblesdale in the south to the Eden Valley in the North. Dent Station which is situated on the line is England’s highest mainline station and is actually 4 miles east of Dent just above Cowgill. Dent Brewery is an independent microbrewery and is one of the most remote breweries in the country. It is situated half way up a hillside at Cowgill, in a barn next to a former farmhouse known as The Hollins a few miles along a single track road between Dent and the railway station. Originally the intention was to sell Dent beer only at the Sun Inn but the beer became so popular that landlords in the Dales and Lakes wanted supplies which expanded production to full capacity. The Dales Way is an 84 mile Long Distance Footpath starting from Ilkley in West Yorkshire to Bowness-on-Windermere in Cumbria and passes through the Yorkshire Dales National Park and also the Lake District National Park. The route, being mostly along river valleys, is shorter and less strenuous than the more well known Pennine Way and Coast to Coast Walk even though the first section in Upper Wharfedale from the Watershed at Cam Houses in Langstrothdale down into Ribblesdale is very steep going, up and down. The next section follows the river valleys of Dentdale, the River Mint and River Kent before descending to the shores of Windermere. *This walk can be done as two small walks. We turn left out of the car park and walk along the cobbled road past the two pubs on the right and the church on the left. The cobbles become tarmac and we head forward to Church Bridge over the River Dee. Just before the bridge we turn right and follow the Dales Way which after a short way, turns left over a grass footbridge over a stream. We head across the field to pick up the riverside. We keep following the Dales Way with the river on our left for about 10 minutes then through the little gates and fields going away from the river until we come to a road. We turn left go over Mill Bridge then almost immediate left again over a stile in the wall signposted Tommy Bridge ¼. We head forwards, still on the Dales Way, uphill through the field following the yellow arrow to Tommy Bridge. We go over the bridge and turn left signposted Scotchergill and follow the River Dee on our left. After about 15 minutes the path turns right at the signpost to meet the road. We turn left over Scotchergill Bridge and follow the road back to Church Bridge where we started at Dent. *From here you can make your way back into the village or you can continue with the second half of our walk. *We cross over Church Bridge and turn right signposted Hippens ½ and follow the Dales Way with the River Dee now on our right. When we come to the road we turn right for a very short way then go through the gate next to a seat on the right to continue on the Dales Way following the river. At the next road we cross straight over and just keep following the river until the path bears left over the field to the road. We go over the stile and turn right along the road for a short way then turn right crossing the footbridge opposite a house called Ellers. After crossing the bridge we turn right signposted Monument ¾ and follow the river on our right. When we reach the road we turn right and follow the road for a few minutes until we come to Barth Bridge. We do not go over the bridge but head straight forwards on the track. We follow this track until we meet the road then turn right back to Church Bridge where we started and make our way back into the village. This is an easy flat walk following the River Dee on public rights of way through fields and on some small sections of quiet road. For full walk approx 8.3 miles allow 3 hours. First half of walk to Tommy Bridge and return to Dent approx 3.7 miles allow 1½ hours. Second half of walk to Ellers and return to Dent approx 5.2 miles allow 2 hours. Use OS Explorer Map OL2 Yorkshire Dales, Southern and Western areas. Start point: Dent pay and display car park. Dent is in Dentdale in the Yorkshire Dales. From the A1 take the A684 to Bedale, Leyburn and Hawes. Make your way through the centre of Hawes and when the main road bears right to Sedbergh take the left turn to Ingleton. After approx 7½ miles take the small road off to the right and follow this road, bearing left at Cowgill to Dent. Parking: Pay and Display car park in the centre of the village, £4.50 for all day. There are public toilets at the car park in Dent. For refreshments there are a shop, two cafes and two pubs the Sun Inn and the George and Dragon. There is also another pub, The Sportsmans Inn, further down the road at Cowgill.